To construct a multiplane, you must imagine what a real environment is like. Take a look at your background picture and imagine a camera moving through the space. Notice that objects in the picture move at different speeds depending on where they are in relation to the camera lens. Building a multiplane requires an understanding of the scene's background, as well as the positioning of the elements on different layers. 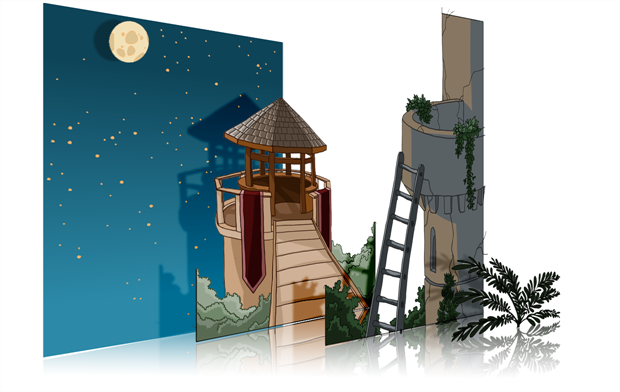 Although the bottom of the tower is hidden behind the plant and the ladder, each of the multiplane layers should be a complete drawing. This is because hidden portions may show up during a camera move later on in the scene. You can position layers on the Z-axis using the Side and Top view. Positioning your element closer to the camera makes them appear bigger. You can also move elements towards the camera or away from the camera while keeping the same size aspect ratio in the Camera view. 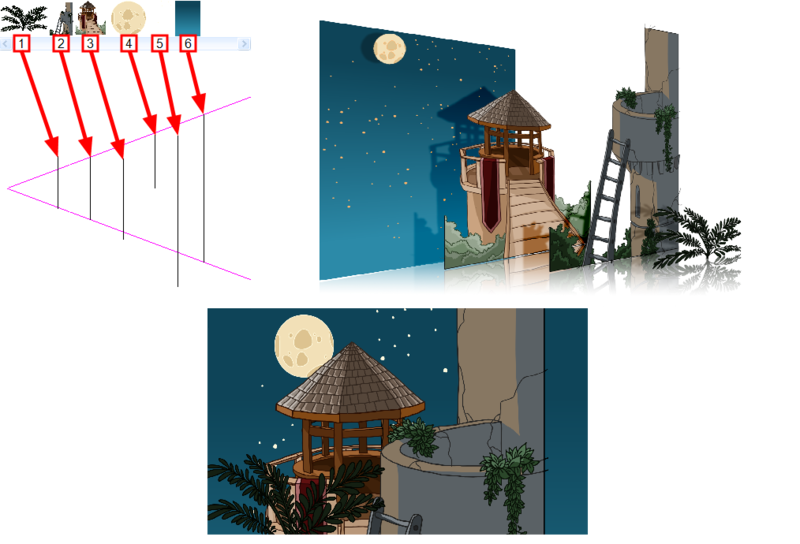 It is a good idea to keep a Camera view open to see what your scene looks like while positioning elements in the Top and Side views—see Top View, Side View and Perspective View. ‣ In the Advanced Animation toolbar, select the Maintain Size tool. ‣ From the top menu, select Animation > Tools > Maintain Size. ‣ Press Alt + 6. In the Side or Top view, select one of the layers in the thumbnails section. You can also select a layer from the Timeline view. The selected layer is highlighted in the Top, Side and Camera views. Drag the layer to the correct depth position in the camera cone. Your element aspect will remain the same in the Camera view. ‣ In the Tools toolbar, select the Transform tool. Make sure the Peg Selection Mode option is disabled in the Tool Properties view. ‣ In the Advanced Animation toolbar, select the Translate tool and select a layer from the thumbnails section of the Top or Side view. ‣ Select a layer from the Timeline view. The selected layer is highlighted in the camera cone. In the Top view, drag the element sideways to position it horizontally. Hold Shift while dragging the element to make sure it only moves along the X-axis. In the Side view, drag the selected element up or down to position it vertically. Hold Shift while dragging the element to make sure it only moves along the Y-axis.